You can watch the sun rise over the unspoiled picturesque headlands, play a game of tennis or simply laze by the pool. 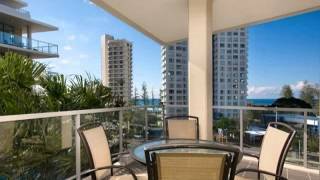 Swell Resort is within easy walking distance to the famous Burleigh surf beach which is patrolled 365 days of the year. Take a short stroll through Burleigh's own national park and headland, or enjoy the diverse range of restaurants, cafes and shops, all at your doorstep. Just a short 10 minutes from your door, is the famed shopping, dining and beaches of Surfers Paradise, or enjoy a day at one of the fabulous Gold Coast theme parks. A one bedroom apartment with full kitchen and laundry, modern décor, reverse cycle air-conditioning, separate lounge area from bedroom, ensuite, Foxtel, DVD player and complimentary unlimited NBN internet. All apartments have their own balcony or courtyard. A two bedroom apartment with full kitchen and laundry, modern décor, reverse cycle air-conditioning, separate lounge area from bedrooms, Foxtel, DVD player and complimentary unlimited NBN internet. Bedding: One king bed and two single beds. A large apartment great for families with full kitchen and laundry, modern décor, reverse cycle air conditioning, separate lounge area from bedrooms, three rooms and two bathrooms, Foxtel, DVD player and complimentary unlimited NBN internet. All apartments have their own balcony or courtyard, some apartments are two storey. Bedding: One king bed, two single beds and one set of bunk beds.